I love almond croissant. It is my most favourite pastry item. S and I have our unofficial quest for the best croissant in Melbourne. It’s actually not a planned quest but we just couldn’t help ourselves when we saw almond croissants anywhere we go...we always jumped to one. The one we enjoyed the most was from the local French cafe in Richmond near S’work, Almost French. It’s humble cafe that made great bread and pastries. It is such a hidden gem waiting to be discovered. The croissant recipe came from Bourke Street Bakery cookbook but the almond croissant part came from Poh’s Kitchen’s first episode with Emanuelle, a French chef from Perth. Poh’s Kitchen show got me hooked from the first episode, with the almond croissant and all. I love the show. Coming from the same kind of background, South East Asian with Chinese heritage, I feel related to many of her recipes. Her food brings back my childhood memories. I made almond croissant before with store-bought croissants and followed the recipe called for almond essence. It was okay but I didn’t enjoy the artificial-like flavour/aroma of almond essence. I also think that almond essence is unnecessary when there is a large amount of ground almond in the recipe. I made these almond croissants using my home-made croissants. Apparently, almond croissant was created by French bakeries as a way to use up the day-old croissant. What a clever idea! Turn a somewhat stale croissant into something truly sublime! 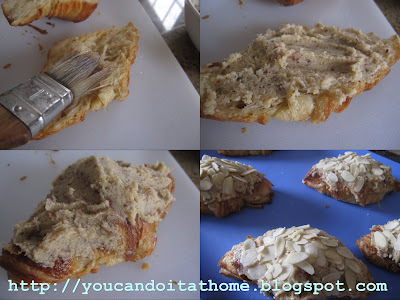 Almond croissant is croissant split in half, dipped or brushed with sugar syrup. The croissants then filled and topped with almond cream. Don’t be alarmed with how rich they are. Yes, they’re naughty, but very very nice, buttery croissant with crispier shell (because of syrup) and moist creamy almond filling. What’s not to love? Those French bakers are genius! The croissants are traditionally baked under a tray. Hence, the mystery is solved why they’re rather flat (I don’t think every boulangerie do this, only the one adhere to the traditional way does). I am still on the mission practicing making croissants, which I’d like to believe that I’m getting better at it. Though, I’m slowing down a little now, I’m only do it every second week as I don’t want to start taking up marathon running to burn off those extra calories from buttery croissants. It was nice to have them as a treat every second weekend, just about right. Place milk in a saucepan and bring it to the boil. Meanwhile, whisk egg yolk with 15 g sugar until thick and pale. Add the flour and mix well. Mix hot milk into the egg yolk mixture and whisk well to combine. Put the milk and egg yolk mixture back to the saucepan and cook on low heat for about few minutes until the mixture is thickened, while stirring the mixture continuously to prevent any lumps or sticking. Remove the mixture from heat and mix through vanilla essence and chopped butter. Set the custard aside to cool in a bowl. Cover the custard surface with plastic wrap to prevent skin forming. Cream the 55 g butter and 55g sugar together until it is pale and creamy. Add egg and mix until combined. 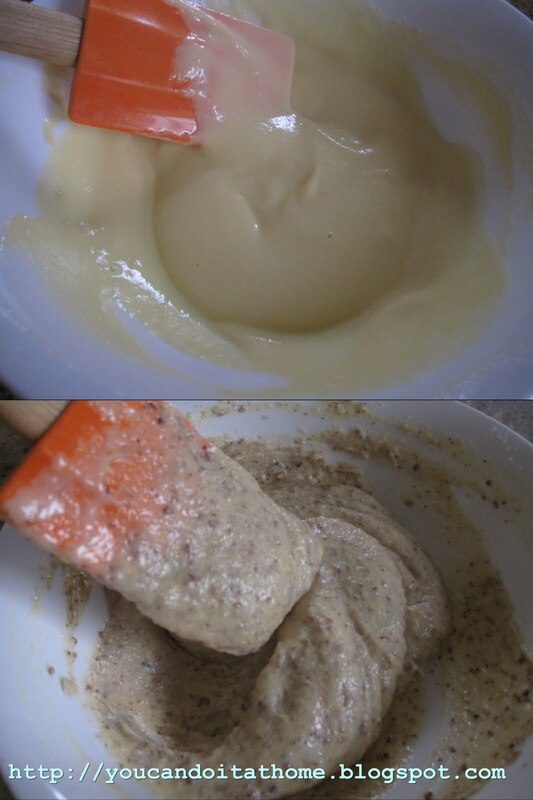 Add almond meal and mix until well-combined. Mix the custard to the almond meal mixture until well combined. Combine sugar and water in a saucepan and bring to the boil until the sugar dissolves. Set aside for to cool. Preheat the oven to 180 C (convection oven). Prepare two large baking trays and line with baking papers or sheets. Using serrated knife splitting croissant in half to get the top and bottom (like you would do with bagel). Brush each half generously with syrup (both top and bottom). Spread almond cream on one half. 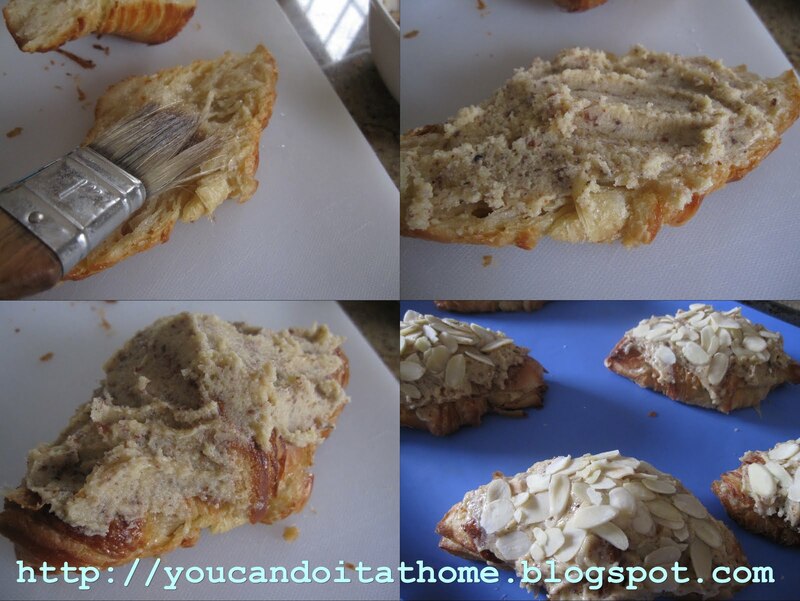 Place the other croissant half on top and spread more almond cream on top. Sprinkle the flaked almond on top. 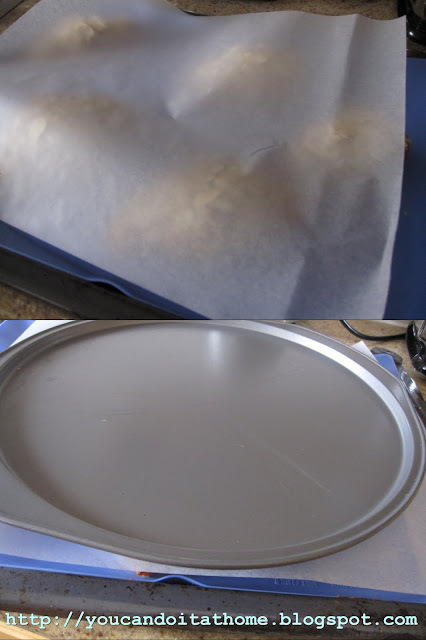 Place almond croissants on the baking tray and lay another baking paper on to of almond croissants. Place another tray on top to flatten the croissant (almond croissant is traditionally baked between two trays). Let the croissant cool down completely before dusting them with icing sugar before serving.